Sonic is the protagonist of the Sonic the Hedgehog series and was created by programmer Yuji Naka and artist Naoto Oshima. Sonic the Hedgehog video game character was introduced by Sega on June 23, 1991. On this page you will find Sonic Games to play online for free. Choose the Sonic game that you want to play from the list above. You can also find Sonic games for kids to play and have fun. BOOKMARK THIS PAGE NOW so you can easily find our site next time you want to play sonicgames online. Welcome to Sonic Games area at HeroesArcade.com. Sonic The Hedgehog is a very popular video game character created by Sega in 1991. Sonic the Hedgehog games have been played by millions of kids around the world and this is why Sonic has become one of the best known video characters worldwide. You might ask what animal is Sonic The Hedgehog? Well, Sonic is an anthropomorphic blue hedgehog, who can run at supersonic speeds and has the ability to curl into a ball when he wants to attack enemies. You can see Sonic in action while playing Sonic online games. Sonic Games online recreates the same famous zones seen by millions of fans while playing Sonic The Hedgehog Games and older Sonic Games. One of the most famous zone is The Green Hill Zone which is a green paradise with blue lakes and the soil is checkered brown. The Green Hill Zone doesn't have to many obstacles but you can still find crumbling platforms and spikes that you must avoid. One of the best Sonic games online is Ultimate Flash Sonic. In this free Sonic game you can play with Sonic the Hedgehog and his friends: Miles "Tails" Prower, Knuckles the Echidna and Cream the Rabbit. You must help Sonic Hedgehog to collect all the rings that you can find and avoid the spikes or you'll lose all the ring collected. Defeat the evil Doctor Eggman and help Sonic to free his friends. You can play all kind of free Sonic games online on this page, like: Sonic Smash Brothers, Sonic The Hedgehog Quiz, Sonic Scene Creator 2, Sonic Tic Tac Toe 3, Sonic Adventures 2 or Sonic X Games. You can even play Sonic games for kids such as: How To Draw Sonic, Sonic Character Designer, Sonic Tetris and even a Sonic Pacman clone. If you would have to vote between Mario and Sonic who would you choose? Play Mario and Sonic games online and find out. 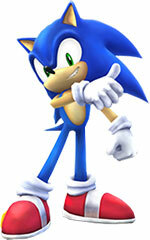 Many small kids already know all characters from Sonic X games and play sonicgames for free online. If you're a fan of Sonic trivia then you should play Sonic the Hedgehog trivia and test your knowledge about this great video game character. If you have a video game console like Xbox 360, Playstation 2, Playstation 3 or Nintendo WII you can play Sonic games like: Sonic Free Riders, Sonic & Sega All-Stars Racing, Sonic Heroes, Sonic and the Secret Rings, Sonic Unleashed, Sonic Colors, Sonic Generations and other Sonic video games. If you don't have a game console nor your friends than you can still have fun while you play Sonic online games at HeroesArcade.com. Enjoy our collection of Sonic Flash Games and share them with your friends on Facebook and Twitter. Don't forget to bookmark this page and come back for more super Sonic games.